Jones digitally cuts up found photographs and kaleidoscopically reassembles them. In “Pretty Little Birds of Prey” she converts blue jay feathers into the fanning petals of a flower, and dozens of sharp, clustered beaks into the stamen. It has the magnetic allure of radiant birds and blossoms, but with bleak hints of Frankenstein’s monster. 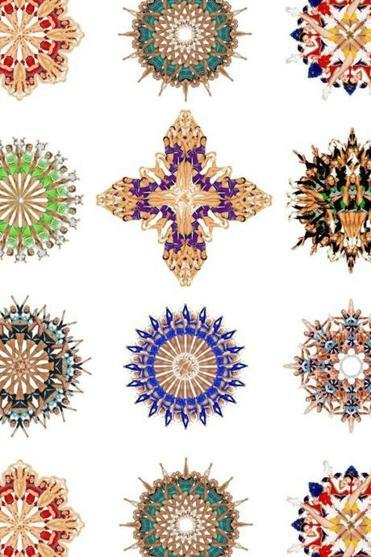 The razzle-dazzle in “Good Cheer Wallpaper” comes from the high kicks and perky costumes of cheerleaders, whose images Jones breaks down and reconstructs into wheeling mandalas, arraying small details into mesmerizing symmetrical patterns. At the same time, it’s impossible to get past the fracture and tangle of body parts. Bare legs kick and crisscross in interlacing patterns; they cluster into long knots of flesh set off by pungently colored costumes. Jones steps right into the seam between cheerleading’s veneer of spunky, all-American girlhood and the sexuality it exploits. Steiner’s comically discomforting watercolors resemble collages: He builds perverse, toy-like figures from many images, painted with breathtaking precision in a disobliging medium. “Clown (Krusty)” has a torso that’s the up-ended head of a balding man, salt-shaker arms, and a gleaming pate composed of a woman’s bottom and genitalia. Krusty, the bitter clown from “The Simpsons,” is a perfect subject for Steiner: children’s entertainment failing to mask darker, more adult motivations. In “Panda (WWF),” the artist builds an adorable cub from a sand dollar, a turtle, and the knobby head and long, curved beak of an ibis. Where we expect cuddly fluff, we get hardness, grit, and cold-bloodedness. The least lurid of Steiner’s works, it still carries the acute unease of opposites fused and innocence belied.